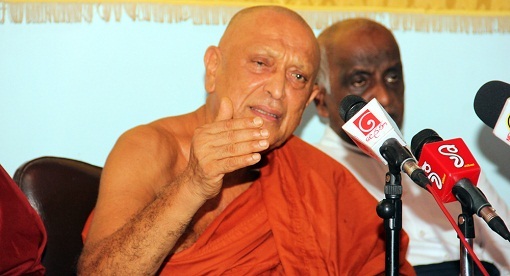 Chairman of the National Movement for a Just Society, Venerable Maduluwawe Sobitha Thero, on Thuerday (25) urged the party leaders to refrain from giving nominations to those charged with corruption, murder, child abuse, and drug related incidents. The observation was made at a press conference held in Colombo. “I insist the party leaders not give nominations to such persons,” he said, adding that the voters also have a responsibility to ‘think twice’ before they cast votes. He also went into say that the present society is facing the consequences of not having the right decision at the last general election. “If the main two parties nominate devils at the forthcoming election, then the people will have to choose the ‘better’ devil,” Sobitha Thero added. The Thero asserted that the candidates should declare their assets beforehand and should also reveal the manner how they obtained money for the election campaigns.